Earlier this year, I reviewed the TECK—Truly Ergonomic Computer Keyboard—one of the few keyboards on the market that combines an ergonomic layout with mechanical Cherry MX switches. As you’d expect, that review opened the door for me to do a couple more ergonomic keyboard reviews. These aren’t simple one-off reviews like some hardware, however, as getting to know a real ergonomic keyboard is not something you accomplish in a few hours or days. 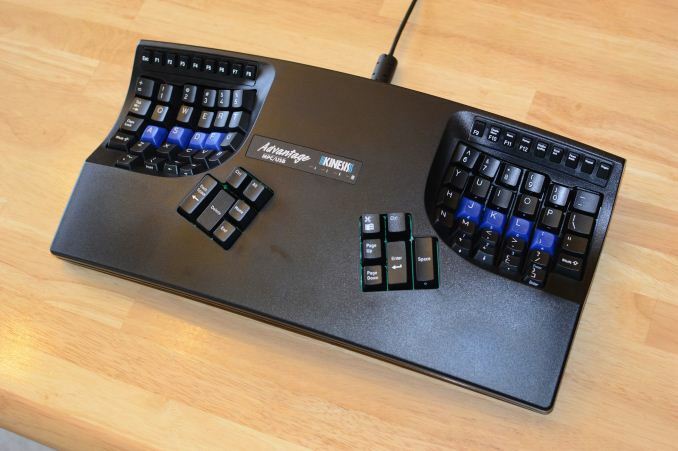 Round two of our ergonomic keyboard coverage brings us the Kinesis Advantage. 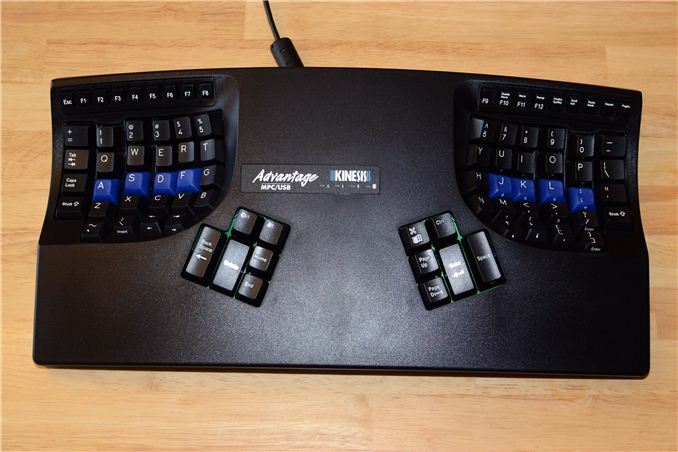 Kinesis is a long-time purveyor of ergonomic keyboards with mechanical switches. In fact, Kinesis was part of the driving force behind Cherry MX creating their Brown switches that are used in most of the ergonomic keyboards. Does more time on the market equate to a better overall experience? That’s what I wanted to find out. The core design of the Kinesis Advantage was largely complete way back in 1991. It consists of an orthogonal key layout with wells for the left and right hands and a fairly sizeable number of keys in the center that can be activated by your thumbs. Over the years, Kinesis has changed a few small things, like switching from the PS/2 to USB connector (with an integrated 2-port hub under the keyboard), adding macro recording/playback functionality, key remapping, and on their Advantage Pro model there’s a foot pedal as well (which I didn’t get for testing). The Pro model also allows for longer macros and has a memory locking switch to prevent accidental reprogramming of the macros. Both Advantage models are available with traditional QWERTY labels or Dvorak labels, or there’s even a dual-label option (the “QD” models), with the keys labeled as shown in the above image. If you want a non-US layout, German, Swedish, UK, and International options are likewise available from the local resellers. Most of the Advantage models come with Cherry MX Brown switches, but there’s a “linear feel” model with Cherry MX Red as an option as well. All that is fine, but the real question is: will the Kinesis keyboard make me a better/faster typist? Failing that, can it at least make typing more comfortable over long sessions, particularly for users that suffer from RSI/CTS problems? I fall into that latter category, as I mentioned in the TECK review, so it’s a particularly pertinent question. I also had some minor concerns with the TECK and key switches that started to “double tap” over time, so I wanted to really put the Advantage to the test and see how it fared. As with the TECK, I started out with a “first impressions” video/introduction. Two and a half months later I’m finally getting around to the conclusion, so I hope the wait has been worthwhile. I’ve also been going back to the TECK on occasion, just to see if I really prefer one design to the other, and I’ve even been using an ErgoDox from MassDrop periodically, though I’m not ready to do a full review of that just yet. I’ll cut straight to the chase here and say that of the three mechanical ergonomic keyboards I’ve used, the Kinesis Advantage ends up being my favorite. However, this is a very subjective opinion and there are definitely people that will prefer one of the other options—or for some, the intended use may prove the deciding factor. I’ll discuss the pros and cons of the Kinesis Advantage over the coming pages before giving the full conclusion and recommendations at the end. More discussion of the gaming aspect would have been welcome. Like actually loading up a couple of multiplayer games and comparing the average player ranking you achieve on one keyboard versus another. I mentioned this on page three, that the split makes it less practical for many games. Frankly, I'm nowhere near a competitive enough gamer to make my rankings at all meaningful. As to your question: it's an ergonomic keyboard, designed specifically for typists. What's it matter if it's useful for games? That's like asking for battery life numbers from a desktop system. Perhaps that's too far; it's like criticizing a professional GPU because it runs games slower than a consumer GPU. Q: How fast can the new NVIDIA Tesla cards run Crysis 3? Maybe, but how many people use their computer *just* in the capacity of a typist? There are probably some in that category, particularly when you consider applications in the professional/office context. But if you're a company that makes these kind of products, it seems like you'd want to avoid being stuck in such a narrow niche? I'd be interested in having a more efficient keyboard, but not if it's going to be impossible to play games with. I do both things on my computer; so I care, for one. Probably there are at least a few others in that boat with me. The company I work for sell buttloads of ergonomic furniture - inverted keyboard trays, oddly uncomfortable ergo mice, what have you. There is also a surprisingly large market for custom-fitted ergo chairs that cost $2000+. I also work with a number of people that use the more conventional split-style keyboards and don't use computers at home virtually at all. I think you are ignoring the fact here that most of those "MOST" people use two finger typing. People willing to use a strangely distorted Keyboard are the true minority (even my own MS natural is causing most people into massive confusion), but within this group of people willing to invest time into getting used to new hardware, gamers are unlikely to be a minority.